I’m pretty sure childhood memories are the new black (and Lisa Frank may be the new Versace). 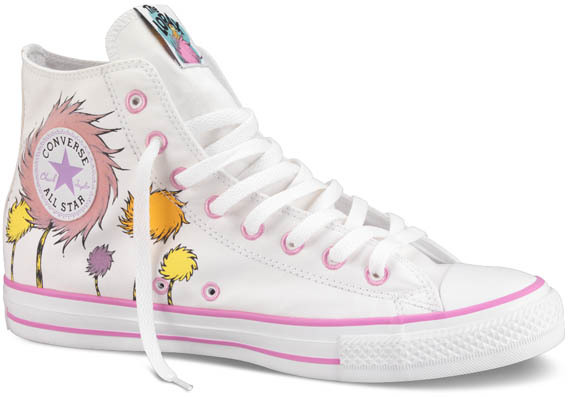 So instead of wearing penny loafers or galoshes or whatever it is adults are supposed to put on their feet, wear these dope Lorax Chuck Taylors. Available in a few different styles, the sneakers feature old school Dr. Seuss artwork of Truffula trees that will bring you right back to elementary school. They go great with anything—stretch pants, culottes, tie-dye jumpers (which also bring me back to elementary school). Jeans would probably work too, but I don’t like wearing them because they’re uncomfortable on my tummy.